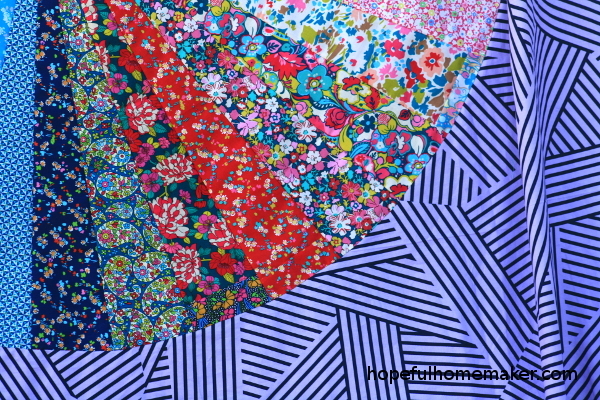 A friend of mine recently went to London, and while she was there, posted a video of the gorgeous collection of tana lawn available at Liberty of London. London is my dream destination and yet I’ve never been there…. When I saw her video I remembered a project I started last spring at Kathy Doughty’s workshop. 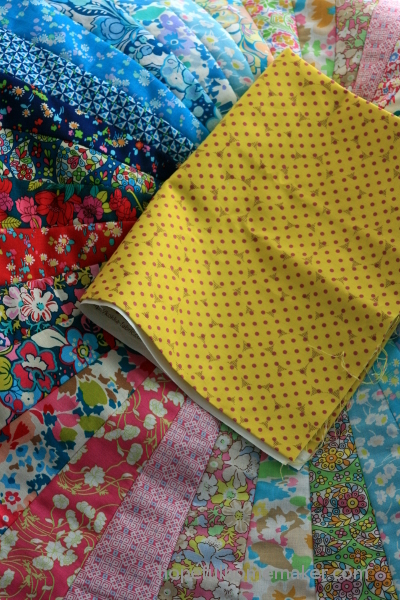 These prints are from the quilting cotton collections that Liberty released several years ago. I have carefully saved every little scrap and was excited to find I could cut 36 long wedges from my pieces! For this project I used a ten degree wedge ruler that is 25 inches long. My fabric pieces weren’t quite that long, and on a few of them I added a strip to make them longer. The dresden is 49″ across. 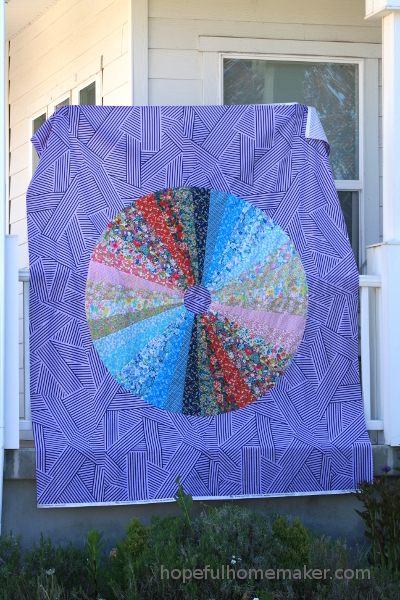 I had a number of ideas in mind for the background of this quilt – NONE of which included this purple Mostly Manor Stripe by Victoria Findlay Wolfe. I had a smaller piece on hand and it happened to be sitting nearby when I was selecting the background. On a whim I tried it out and to my surprise I loved it! I loved purple as a second grader, but have avoided it since. I am learning that it has it’s place in design and sometimes is just the right color to complement a project. The bold navy stripes in this print turned out to be a beautiful contrast to the small scale prints in the wedges. 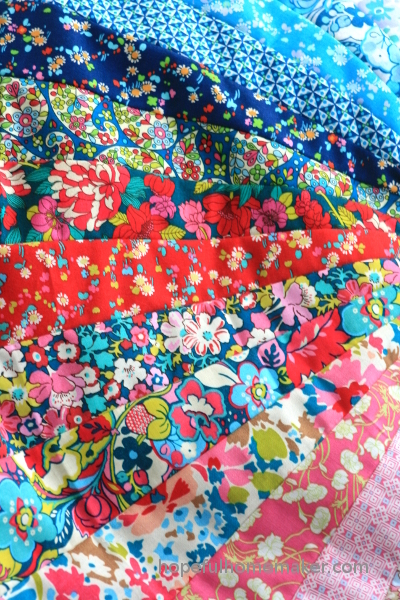 I waited impatiently for yardage to arrive so I could assemble the top. I hand appliqued the outer edge of the dresden to the background. Now it’s just lacking a center, which will be this awesome yellow. I am currently debating quilting ideas before I decide when to applique the center circle in place. I love the colors and prints of these designs. 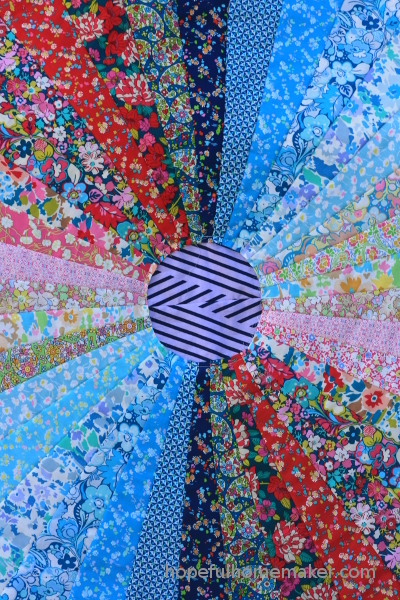 My Fireworks quilt was the original project I made with them. It am happy to have made another quilt top using leftovers. This was a refreshing fast project to indulge in and now I want to make more dresdens!